The team had been told it would be a straightforward mission: enter St. Davids, now little more than a ghost town, retrieve the target and return to base. Trouble is, the target is a man named Victor, and it looks like somebody else got to him first. Michael Evans, crippled survivor of the massacre at St. Davids, has only one goal left: to find his young daughter. And that means journeying north and discovering that during the five days he spent comatose in an underground bunker the world has changed dramatically. And worse, it's still changing. The worst is over. All that remains for the survivors hiding in the castle is to gather supplies to prevent starvation. It is a problem they believe they can solve without further loss of life. But there is another problem: the castle has come to the attention of somebody else. Somebody with strength in numbers. And among that number is a man who might just hold the key to destroying the Infected. The Wildfire virus has caused irreversible damage to the UK, and fleeing looks like the only option left. For Michael Evans, that represents a serious problem. Wheelchair-bound, and with the other survivors at the castle taken hostage by a maniac and her murderous followers, Michael alone must find a way to escape, and he will have to do it fast. Because the end is inevitable. 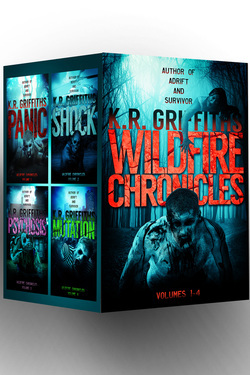 Get the first four volumes of Wildfire Chronicles in one ebook package. The best option for anyone new to the series to start reading them all!